**** The weather ship Polarfront was withdrawn from service in December 2009. 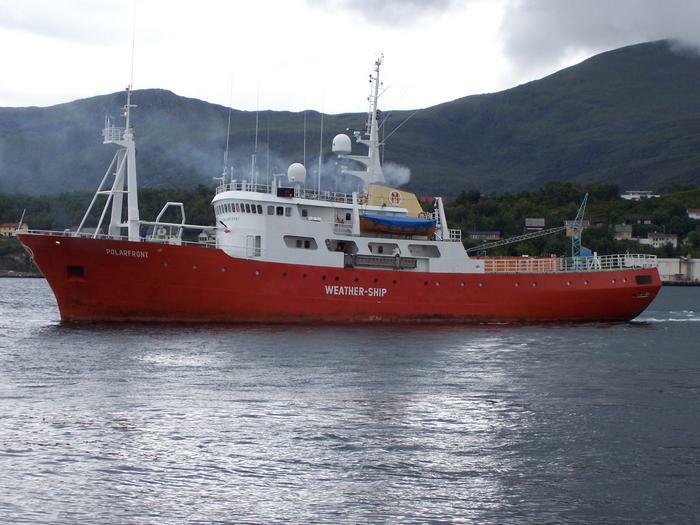 **** A follow on project "Waves Aerosols and Gas Exchange Study" was based on the BAS ship RRS James Clarke Ross from summer 2010 to summer 2013. The aim of this UK-SOLAS project is to make direct measurement of the turbulent air-sea fluxes of sensible and latent heat, momentum and CO2 in order to improve the parameterisation of these fluxes in terms of mean meteorological and sea-state variables. We hope to obtain data in a wide range of conditions, particularly the poorly-understood high wind speed regime. In September 2006 NOCS installed a range of instrumentation on the Ocean Weather Ship Polarfront which will operate continuously for 3 years. The Polarfront is the world's last weather ship - see Nature news article on 9th June 2009. It is owned and operated by Misje Rederi AS under contract to the Norwegian Meteorological Institute (DNMI). This ship and its predecessors have occupied Station Mike (at 66 N 2 E) for 60 years. As well as the DNMI's meteorological observations, a hydrographic program is also run by the Geophysical Institute of the University of Bergen. This high-resolution 60-year hydrogrpahic record is unique. 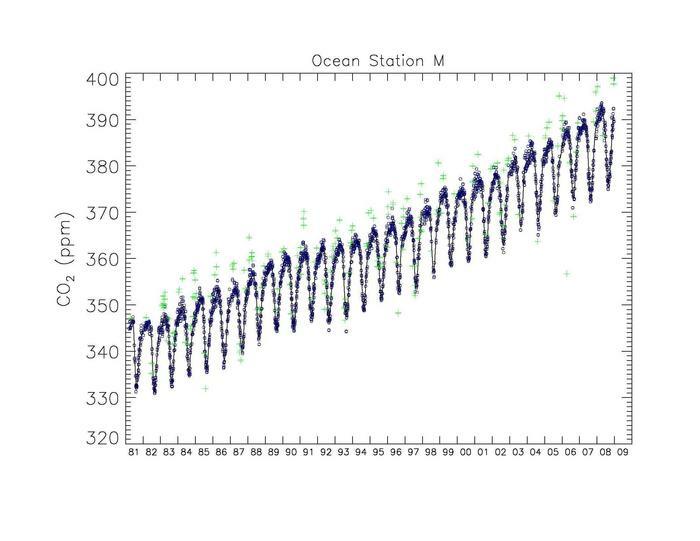 Other long-term measurements carried out on Polarfront are 30 years of atmospheric gas sampling (figure by Thomas J. Conway, Global Monitoring Division, NOAA) and 30 years wave time series (DNMI). 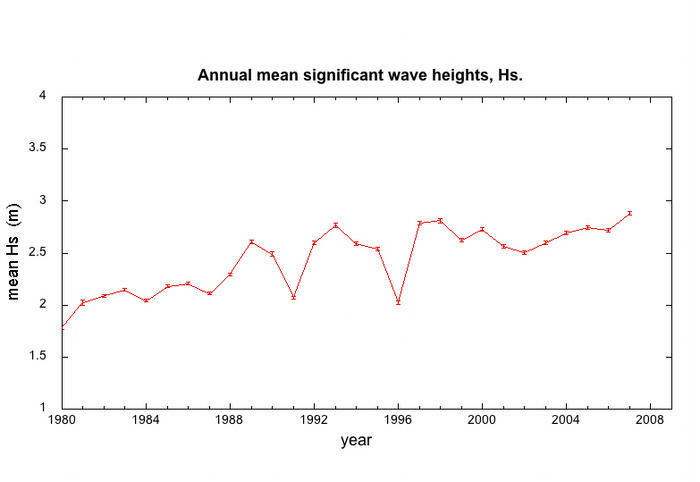 The wave time series shows the mean annual significant wave height for each year - this has increased steadily over the last 30 years. Our instrumentation was installed on the ship at the start of September 2006. Two NOC staff (Margaret Yelland and Robin Pascal) sailed with the ship for the September cruise and sent weekly informal reports - see the Diary links below. A beginner's guide to what we are measuring and why was written at the request of the crew and is available in English (0.5 Mb pdf) and in Norwegian (0.5 Mb pdf) - thanks to Oyvind Synnevag for the translation. **** A follow on project "Waves Aerosols and Gas Exchange Study" took place on the BAS ship RRS James Clarke Ross from 2010 to 2013.